A project that has been in development at our own premises for a large part of this year and having been the subject of many iterations to achieve the maximum possible performance and having successfully undergone extreme and rigorous testing can now be announced. Using our many years of experience and know-how TLCC can supply our own verified and approved Canopy Air Recirculation Unit to your catering business. The PRE Canopy Air Recirculation Extractor is the answer to many problems being faced by current and new catering businesses when required to comply with ever tighter guidelines imposed on catering establishments nationally and locally...including DEFRA 2005. Needing no direct ductwork connections to atmosphere it is a self-contained kitchen ventilation system for all electrical equipment the includes a supply and extract canopy. It has integral fans, scrubbers and filtration systems which is able to clean (and re-clean if required) the air before being introduced back into the kitchen or, if appropriate to a simple grill to enable air egress to atmosphere. 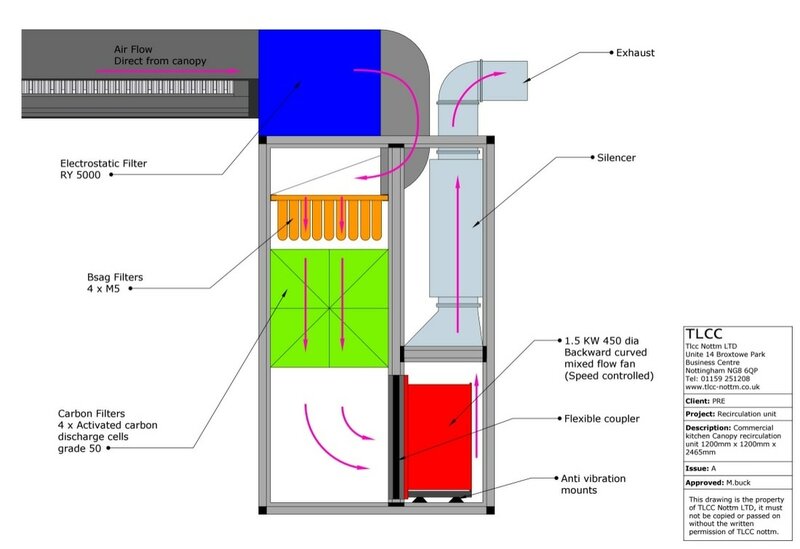 In many cases our CARE (Canopy Air Recirculation Extractor) unit can eliminate planning restrictions. It is able to be sited both internally or externally; either close to the point of extraction or remotely to suit. It captures and contains catering contaminants in an environmentally-acceptable manner and, with long duct runs eliminated the required, costly specialist cleaning is not required so improving fire risks. Our CARE system significantly reduces maintenance and cleaning costs compared to mainstream ducted ventilation systems. To comply with gas regulations any Canopy Air Recirculation Unit is only for use over electrically powered cooking equipment.